Baker’s Treat Slot is a 15 paylines and 5 reels video slot, powered Play ‘N Go software platform. Get ready for a Great British Bake Off, because that is the main inspiration for this video slot. Video slot reels are set up as a tablecloth on beautiful spring day. There are 5 different low value symbols, which are pink, yellow, orange, purple and green macarons. Premium value symbols are lemon cheesecakes, carrot cakes, blueberry pies and cupcakes and additional strawberry sponge which highest paying symbol. Before investing real money players can try Baker’s Treat Slot for free, or visit any Play ‘N Go casino such as: PlayFrotuna Casino, Wild Tornado Casino, Rizk Casino and others to play with real money and win. Before you enjoy cakes, pies and other delicious goods, you need to place your wager. In the lower middle section with “+/-” buttons you can set your bet amount, which ranges from 0.10 to 100. In the lower right corner, is a big green button which is a “Spin”. Next to the “Spin” button is a an “Autoplay” button. With “Autoplay” you can adjust not only number of spins that will go without stopping, but also if you reach certain amount of bet level. Triple Berry Layer cake is a Wild symbol, which can be used as a substitute to other symbols, as well as Wilds can make their own winning combos. Bake Off feature activates as soon as all 5 dessert cakes land on their specific reels. When the feature is triggered you will get a 5 unique spins from Flour Power feature. 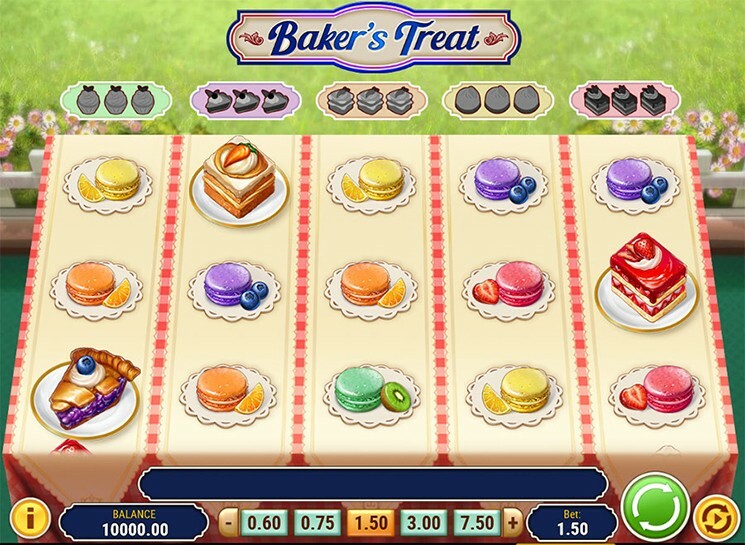 In addition you can win up to 10 special Bake Off spins, if you land any stacked dessert cake symbols. Flour Power feature will award you with 5 different prizes. Each of the 5 awards that Flour Power feature give you, depends on the high paying symbol. If you land one of the 5 stacked high symbol on their associated reel, you will collect a token. When you have 3 same tokens, you will get your prize.